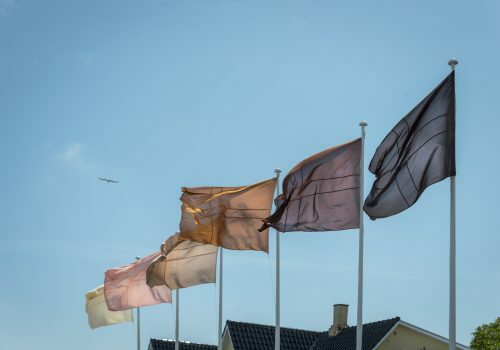 Regional exhibitions often use sociopolitical history as a key in the interpretation of the work of artists who, despite obvious consistencies in their background, do not share a single cultural identity. This approach bypasses individual histories and regularly leads to forms of cultural profiling persistent enough to affect even those younger generations of artists whose work does not deal with collective history. The art from Central and Eastern Europe is no exception. As Zdenka Badovinac (1) has noted, artists and cultural practicioners from this region must be aware that they can only move forward by complying with world standards, as well as, being concerned of how their otherness is perceived. For Badovinac, otherness must be continuously and actively redefined, to save it from becoming a pattern or, worse, drifting into folklore. Today, the work of visual artists from this region is too often considered in direct relation to the socialist ideologies that dominated the former Eastern Bloc, a perspective that fails to acknowledge the breadth and scope of contemporary art practice in Central and Eastern Europe. In this regard, There Has Been No Future, There Will Be No Past curated by Marco Antonini and Sandrine Canac was conceived as a platform for self-representation and dialogue. 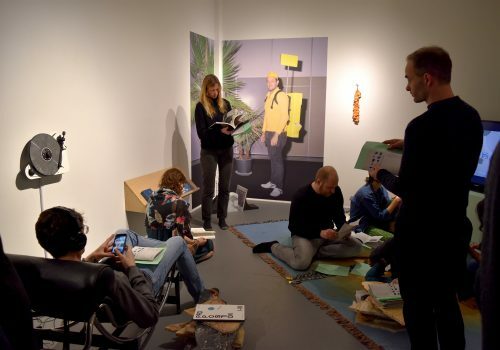 Participating artists include Rada Boukova, Eric Stephany, Igor Eskinja, Andreas Fogarasi, Wojcieh Gilewicz, Marzena Nowak, Jan Mancuska, Jiri Skala, Svatopluk Mikyta, Anetta Mona Chisa & Lucia Tkacova, Kader Muzaqi, Svetlana Mircheva, Irgin Sena, Ellie Krakow, Tehnica Schweitz (Gergely Laszlo & Peter Rakosi), Katarina Sevic, Katarina Zdjelar and Maziar Afrassiabi. The curators invited eight ISCP alumni from Central and Eastern Europe whose work does not address the social and political history of their countries. Each of the artists was invited to nominate a peer artist to take part in the exhibition in an effort to expand the geographic context and ambit of the project. This nomination process engaged the artists in the curatorial process allowing them to further articulate on their own artistic discourse, placing their work and the work of their peers on a personally drawn ‘map’. The invited artists have not only contributed to the visual and conceptual outcome of the exhibition, but also offered new perspectives in its interpretation. Furthermore, the artists will incorporate ‘non-art’ images (inspirational material, unfinished works, archives, sketches etc.) in the exhibition, highlighting the importance of personal materials in the development of their work. Deliberately avoiding the creation of paradigmatic models for the interpretation of contemporary art from Central and Eastern Europe, There Has Been No Future, There Will Be No Past adopts a free and discursive approach. In this way, the exhibition emphasizes the network of intellectual exchanges that sustained its development, highlighting the fragmented complexity of an unpredictable group portrait. (1) From: ‘Undefining the Other: Markus Miessen in conversation with Zdenka Badovinac’, in Markus Miessen, ed., East Coast Europe, (Berlin: Sternberg Press, 2008), 71. This exhibition was supported by: Austrian Cultural Forum New York, Brooklyn Arts Council, Cultural Services of the French Embassy in New York, Czech Center New York, Italian Cultural Institute in New York, Ministry of Culture of the Slovak Republic, plus421 Foundation, Polish Cultural Institute in New York and Supreme Digital. Thanks to the Young Visual Artist Awards (YVAA), a major artist fellowship in Central and Southeastern Europe that culminates with a residency at ISCP for supporting emerging artists of the region. Andreas Fogarasi, NY, NY (after Herb Lubalin), 2008, 9 MDF elements, Dimensions variable. Maja Hodoscek will screen Promised Land, a video dealing with labor market discrimination towards migrant workers in various EU countries. This project explores their position within contemporary society, their rights, working conditions and existential situation. 149 workers, who went to Slovenia from ex-Yugoslavia to work in a construction company called Gradis, were fired because the company went bankrupt. They currently all live together in a single home near Hodoscek’s house. Promised Land shows Hodoscek inviting them over for lunch, cooking goulash and having fun. Maja Hodoscek lives and works in Celje, Slovenia. She graduated in 2009 from the Faculty of Education, Department of Fine Arts, University of Maribor, Slovenia. Her work has been shown nationally and internationally at multiple video festivals and exhibitions. In 2010, Hodoscek received the OHO Award for Young Visual Artists organized by Zavod P.A.R.A.S.I.T.E, Ljubljana, Slovenia. Jiri Skala will present a performance, Fathers Mouth, written and filmed two years ago but never presented live. A play for a couple, it will be performed by Marek Milde and Kristyna Milde. Skala strives towards freeing himself radically from the language of visual art in order to embrace experimental forms of literature. Skala’s work often demands the undivided attention of it’s viewer, at the same time as it is characterized by a strong will to reach out and communicate. His strength lies in connecting the literary process with artistic content, and his ability to thematize personal relationships as well as analyze larger complex social relations. Jiri Skala (born 1976 in Czech Republic) studied at the Prague Academy of Fine Arts, and at the postgraduate program at Palais de Tokyo in Paris, France. He is co-founder of the Etc. 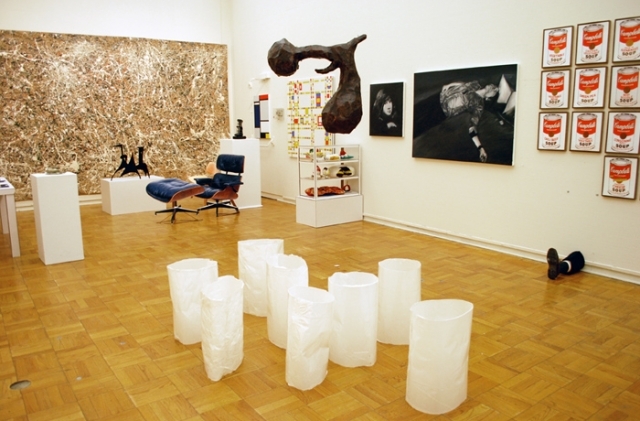 Gallery in Prague, established in 2004, and is a member of the PAS group, together with the artist Tomás Vaněk and curator Vít Havranek. He is listed in The Younger than Jesus Artist Directory compiled by the New Museum in New York, and in November 2009 he was awarded the Jindřich Chalupecký Award for young artists in the Czech Republic by Vaclav Havel. JRP Ringier published his bookOne Family of Objects in 2010. Maja Hodoscek, Promised Land, 2010, postcard. 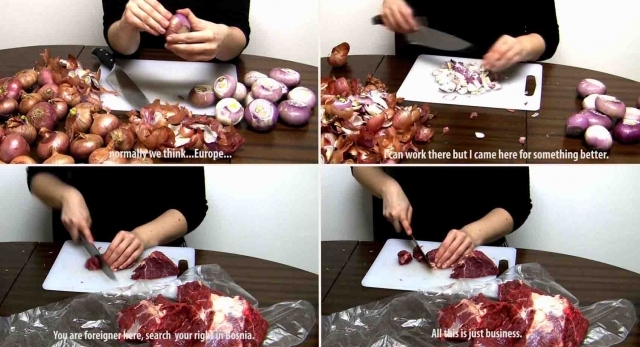 Maja Hodoscek, Promised Land , 2010, video still. Jiri Skala, Fathers Mouth, 2008, a one act play for two people; HD video, 16 min..
Jiri Skala, Naming, 2008, a play involving two people; HD video, 3 min..
Stephanie Syjuco is a visual artist whose recent work uses the tactics of bootlegging, reappropriation, and fictional fabrications to address issues of cultural biography, labor, and economic globalization. Working primarily in sculpture and installation, her objects mistranslate and misappropriate iconic symbols, creating frictions between high ideals and everyday materials. 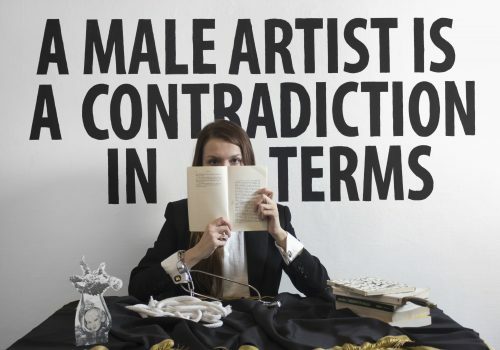 Her work has been shown internationally, including P.S.1, the Whitney Museum of American Art, SFMOMA, the Museum of Contemporary Art San Diego, the Contemporary Arts Museum Houston, the California Biennial, and the Frieze Art Fair, among others. Upcoming shows include Shadowshop at SFMOMA, an alternative gift shop addressing issues of capitalism and distribution, Particulate Matter: Things,Thingys, Thingies, a solo exhibition at Gallery 400, University of Illinois, Chicago, and a large-scale installation at Columbus Museum of Art, Ohio. In his performances, installations, and urban interventions, Theaster Gates — an artist, musician, and ‘cultural planner’ — transforms spaces, relationships, traditions, and perceptions. Exploring architecture as a tool for mediation and meditation, Gates draws from both urbanism and art to provide what he terms ‘moments of interstitial beauty’. Gates’s work has been exhibited widely. In 2010 alone, he has performed and exhibited at the Whitney Biennial and the Armory Show in New York, the Milwaukee Art Museum, the Pulitzer Museum of Art in St. Louis, and the Contemporary Arts Museum in Houston. Upcoming projects include solo shows at the Aldrich Museum, Ridgefield, and the Museum for Contemporary Art, Detroit. Gates is a 2010-11 Loeb Fellow at Harvard Graduate School of Design. Theaster Gates, Cosmology of the Yard, 2010. 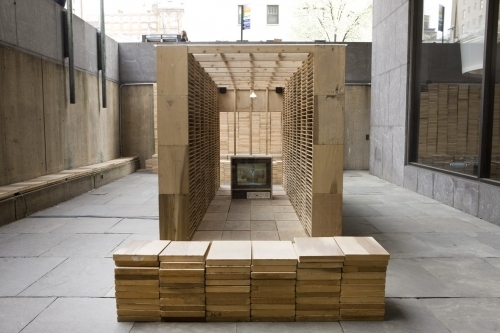 Whitney Biennial 2010. 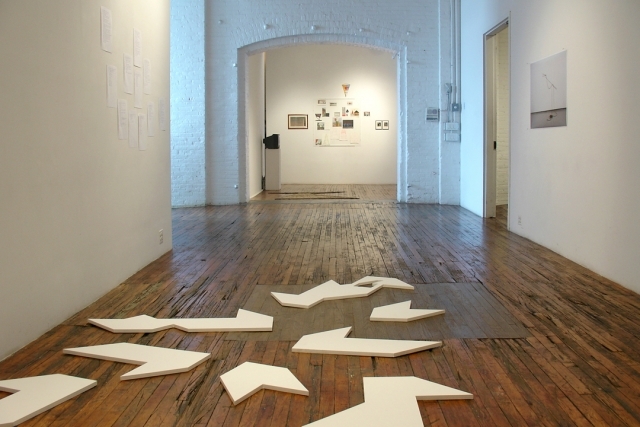 Stephanie Syjuco, notMOMA, 2010. Installation view at Washington State University Pullman. Video documentation of Theaster Gates' presentation.